The idea behind our Total Care Program is simple. You have better things to do with your time than take care of your property. How many times have you spent your entire Saturday working on your yard and landscaping, and realize at the end of the weekend that you didn’t do anything that you really wanted to? Take back your weekends! Our Total Care Program will take care of all of your landscape maintenance needs for the entire season. We will put together a custom program for you that will cover all of your needs. We also offer a less comprehensive plan, our Basic Care Program. To find out which program is right for your needs, contact us for a FREE consultation! Our spring cleaning brings your property out of hibernation and prepares it to look beautiful for the seasons to follow! 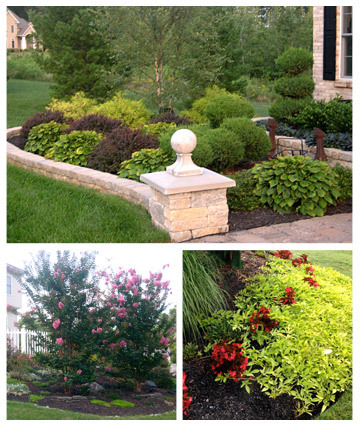 Adding seasonal color will enhance your landscaping by providing instant and varying colors during the growing seasons. We use our expertise to select the right plants and decor for your property, providing interest all year long! Mowing your lawn is one of the signatures of your whole property. Our experts use some of the best mowing equipment and professionally maintain machines to perform at their best. We take extraordinary care to make your lawn look like the Orioles are about to play nine innings on it! Proper care and preventative maintenance of your irrigation system prevents problems and costly repairs in the summer seasons when you need it the most. Our crews have been extensively trained with pruning techniques that enhance plant health. We prune to achieve proper growth and branching habit, and encourage overall health and appearance of you plant material. Our lawn care program consists of a six step process that keeps your lawn healthy and happy throughout the entire season. Each step includes timely feedings of balanced fertilizers, crabgrass and broadleaf weed prevention as well as dandelion and weed control. March thru April- An application of complete balanced fertilizer with pre-emergent crabgrass and weed control. The pre-emergent application keeps weed seeds that have blown into your turf from germinating and thus suppressing weed growth. June thru August- We apply a complete balanced fertilization to assist the turf when it is being stressed the most from the summer climate. We inspect the turf areas for stress, mechanical damage, insect damage, diseases and fungus. We also spot treat any broadleaf weeds that are present. October thru November- An application of winter feeding fertilizer that promotes root development and stronger turf grasses. This allows your lawn to stay green and beautiful longer into the winter season and promote a faster green up in the spring. Aerating is a very important step in the overall health of your lawn. It helps encourage water and nutrients to enter the soil and root zone of the turf. Aeration also loosens compacted soil and allowing air to enter, giving the root zone more area to grow. Over seeding during this process allows the new grass seed to make better contact with the soil and establish faster and healthier before frozen temperatures arrive.